Everyone's favorite dark political drama House of Cards is about to make its long-awaited return to Netflix for Season 3. Those of us who follow the show are dying to find out what kind of political gameplay Francis, who's now been sworn in as President of the United States of America, has up his sleeve. To tide us over until the season drops, the SVOD service has just released a short, but very tense, teaser heavily suggesting Frank and Claire may be having marital problems. See for yourself below. Never did I think watching Frank and Claire Underwood pose for photos would be so entertaining. Just as Netflix has done on numerous occasions in past episodes of House of Cards, the've managed to pull “so much” from “so little.” While it really is just the President and his First Lady getting their photo taken, in reality it is so much more. The subtext beneath the surface, something House of Cards delivers in spades, brings so much tension into the room, you feel like you could cut it with a knife. The fact that they've wrapped the entire 30 second teaser on this one moment leads us to believe there may be marital troubles on the horizon in Season 3. Admittedly, Francis and Claire's marriage hasn't been all roses thus far, but this latest promo wants to assure that we know the couple's relationship is going to play a vital role in the upcoming highly-anticipated season 3. What is it they say? "A picture is worth a thousand words." Wow, they're sooo right! Remember, Claire did have that affair back in Season 1 when she left Frank to go stay with her childhood friend Adam Galloway in New York. Then there was that very uncomfortable sexual encounter Frank and Claire had with Secret Service agent Edward Meacham. We're definitely curious to see the awkward conversations that may result from that little rendezvous. Still, yet, the prior Season 3 trailer confirms that fans should expect a whole heck of a lot more than just relationship problems. Check that out below. House of Cards has been a staple for Netflix's original programming. Not only is it a hit with fans but it somewhat singlehandedly redefined the term binge-watching. While we realize not everyone is tuning in, numbers are likely to continue to rise if it continues to receive critical praise and awards. Although a recent study showed only 31% of Netflix subscribers were currently tuning into the series (and we're still a bit skeptical on that one), it's likely, like AMC's Breaking Bad that came before it, to continue to see its numbers rise as the seasons wear on. Thus far House of Cards has had a way with giving fans everything they want and more. So here's to hoping that trend continues with the upcoming Season 3. With Kevin Spacey hot off his recent Best Actor win at the Golden Globes, we have very high hopes for the return of Frank Underwood. 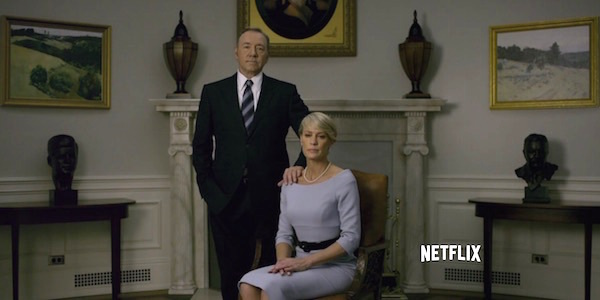 Netflix's House of Cards, starring Robin Wright and the above-mentioned Spacey (and their gigantic new jet), returns Feb. 27, 2015.